They have been called "the kings of all roofs," and they cover some of our most important buildings. Domes are curved structures -- they have no angles and no corners -- and they enclose an enormous amount of space without the help of a single column. Despite their thinness, domes are some of the strongest and stiffest structures in existence today. Before domes, there were rectangular buildings. Almost all ancient buildings had roofs supported by forests of columns. The columns prevented the heavy roofs from collapsing, but they left very little open interior space. Soon, ancient engineers began experimenting with arches. Around 100 A.D., Roman builders rotated an arch in a circle and discovered that it created a strong three-dimensional shape -- the monolithic dome. In time, they were capping churches and mosques with this new and brilliant design. The earliest domes were made of stone. The earliest masonry dome, the Pantheon, was so heavy that engineers carved intricate shapes, called coffers, along the walls to reduce the weight of the enormous structure. They also gouged a hole, called an oculus, at the top, which created a daily light show for which the Pantheon is still famous. As domes grew taller and taller, they became heavier and heavier. By 532 A.D., ancient engineers realized that they could lighten their domes by scooping out the spaces between the arches. This design allowed sunlight to pour into the dome without weakening the structure. The Mihrimah Mosque, built in 1555 by the great architect, Sinan, is pierced with 161 windows! Check out the forces that affect monolithic domes like the Mihrimah Mosque! Sometimes, they become too heavy. When the dome on St. Peter's Basilica began cracking in the early 18th century, Vatican engineers tied several iron rings, called tension rings, around the structure to prevent it from collapsing. Fortunately, their emergency fix stood the test of time. 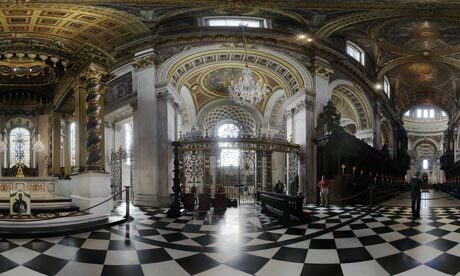 Take a look at the forces that affect ringed domes like St. Peter's! In the quest for height, engineers came up with a few tricks. By the early 1400s, Roman engineers began building two domes in one to create the illusion of even greater height. The U.S. Capitol dome, built in 1793, gets its height from this engineering sleight of hand. The large outer dome is a thin shell, held up by a ring of curved iron ribs. Underneath it all is a smaller, self-supporting dome, visible only from the inside. The U.S. Capitol dome is also one of the earliest domes made of pre-fabricated cast-iron ribs. The switch from heavy masonry to lightweight metal ribs in the late 18th century greatly reduced the weight of domes being built around the world. But a 20th-century invention would change dome engineering forever. In the 1950s, a radical new design -- the geodesic dome -- changed the way engineers looked at domes for the first time in 2,000 years. Invented by American engineer and architect Buckminster Fuller, the geodesic dome is a partial sphere shape structured from a series of triangles, rather than a series of arches. Today, geodesic domes come in an almost endless variety of shapes and styles. Possibly one of the most famous domes in the world, the Epcot Center in Orlando, Florida, is a geodesic dome. Check out the forces that affect geodesic domes like the Epcot Center dome! A new generation of domes equipped with retractable roofs, like the Toronto SkyDome, has become a popular choice for sports stadiums throughout the world. Now that you know a bit about the history of domes, test your knowledge in the Dome Challenge!